Can you believe it? 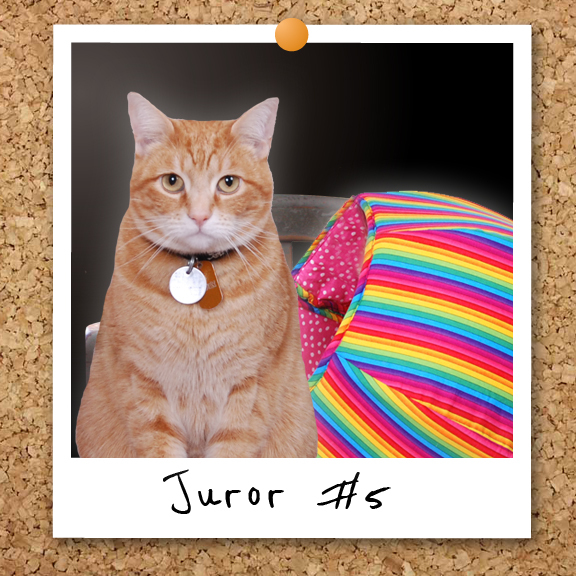 Only 2 more days until The Friskies voting comes to an end. And only 2 more days to go behind the scenes with the cast of "Katie Is...ACCUSED." 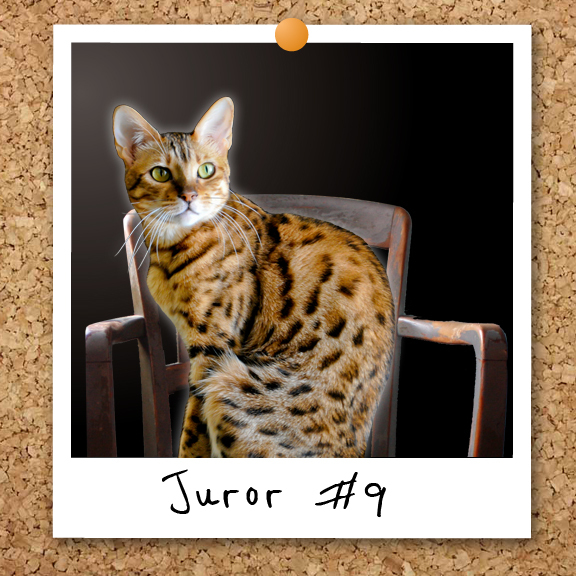 Today we're zeroing in on Jurors #5 and #9, Twix & Zoey. You may not know Twix, a.k.a. Juror #5, but I bet you know about his famous Cat Balls! NO, not THAT kind of balls! Twix's human is the creator of Jennas Red Rhino's Cat Ballsl! 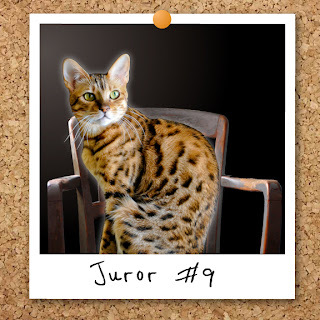 Our second guest is Zoey, the beautiful bengal serving as Juror #9. Most of you will recognize her from The Chronicles of Zee & Zoey. 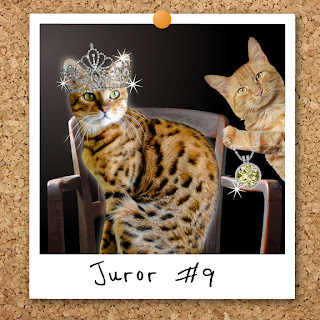 ...they're the ones that hosted the Cat Ruler of the World contest! KATIE: Twix I'd like to start with you. KATIE: Twix, if you're ready to join us...we'd all love to know your favorite part of my video, "Katie Is...ACCUSED." TWIX: Oh, sorry. I was busy cat balling. My favorite part? Well I love the sound in your video! KATIE: Your kidding, right? That piano dribble that Glogirly made up? She can't even tell me what key it's in. If her piano teacher sees this video, she'll have some splainin' to do. TWIX: I also got a chuckle out of the newspaper headlines. "IF THERE IS NO SPIT, YOU MUST ACQUIT." TWIX: I feel the trailer is suggesting that the DOG got Katie framed...just sayin'. Ok, gotta get back to my Cat Ball. KATIE: So Miss Zoey, thanks for being here. What was YOUR favorite part of "Katie Is...ACCUSED"? ZOEY: Well Katie, I must say I was quite partial to the fashionable tie that Cathy Keisha was wearing in your signature pink color. Being the diva that I am, I feel a properly accessorized feline is essential to one's image and I even thought your silver cuffs were quite becoming. KATIE: *whispers under breath* DIVA??? Well THAT's an understatement. ZOEY: I'm sure it was an oversight made by that inept charming assistant of yours, Waffles, and I hope if I am in another one of your law breaking escapades (which is bound to happen, given your prior propensity to breaking the law), that this glaring oversight does not happen again. KATIE: So Zoey, if you're done talking about yourself, how about you tell us what the other cats of Zee & Zoey are saying about the video. ZOEY: Truth be told, they are saying nothing. To this day, I don't think Zee even realized he was part of your Real Housecat Series, as he napped through the whole episode and we do not allow the kittens to watch videos, especially those that are FG rated (Feline Glorified.) I would prefer to be the star in our house. KATIE: Ok, I'm almost afraid to ask. Guilty or Innocent? ZOEY: Why guilty, of course. ZOEY: What sensible cat could possibly resist pulling and chewing a good shoelace? Oh dear, wait a minute, that came out wrong. ZOEY: Everyone, please calm down - let me rephrase. Why innocent, of course. On the grounds that it is engrained in the very nature of our feline being to pull and chew shoelaces. Cats cannot help themselves and therefore, KATIE IS INNOCENT. I rest my case - can we please go home now and nap? I need to polish my jewels. Now that the presidential political ads have gone dark and the flyers aren't flying anymore, we have just a couple days to recruit a few more votes for "Katie Is...ACCUSED." If you'd like to help, we have our OWN flyer that you can print to slip under your neighbors door or hand to the grocery store cashier. Every vote counts for this little tuxie from Minnie-Apolis. Zoey has a very mystical, unearthly glow/aura about her. I think this should have disqualified her for jury duty. Love the Diva's verdict. MOL. My paws are crossed for you, Katie! My human saw one of those Friskies awards in St. Louis and said they were awesome! She is also probably going to the awards show in Los Angeles on Wednesday... right after her dental appointment! We voted for you. Have a terrific Thursday. Zoey is very correct and she looks stunning in the tiara. Katie is guilty of chewing the shoelace but it isn't a crime cause it's what cats do. Really should have had Zoey's tiara on during the movie it adds a certain oomph. How funny. After some thought, Zoey came up with the correct verdict, and she looks very cute in that tiara. Well, it’s about time you finally got around to interviewing me! You must agree now that you have properly accessorized me, that I look stunning in that tiara and that it compliments my beautiful eyes just purr-fectly. I can’t speak on behalf of Twix’s balls, but I can assure you that every bit of me is real – from my stunning spots to my gorgeous silky fur coat. And I am glad that the other kitties are seeing the sensibility of my verdict!! We voted! Katie must be acquitted! Zoey is completely right - a girl can never have enough bling-bling! I just gotta say that is the best looking jury ever! Oh my, with friends like that you need to wear a bulletproof vest! We emailed our kitty friends and family and ask them to vote too. Katie is.......ACCUSED! For best picture! Polish her jewels … play with his balls … cat balling? Is this not a G-rated blog anymore? 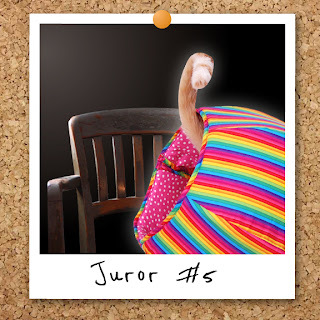 I'd get Juror 9 dismissed except that she said I'm her favorite part. Wowwie! Zoey is even more a diva than me! Hilarious! I am really hoping you win. With all the work you have put in, how could you not? These cats have a right to their stardom!